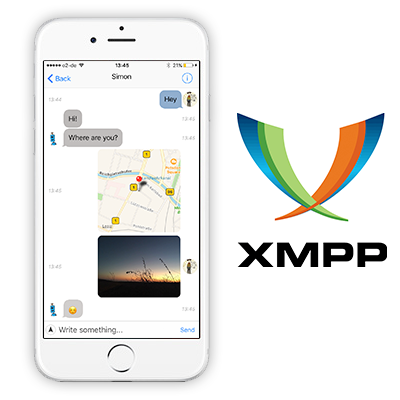 The XMPP Chat SDK is a fully featured, white label XMPP client for iOS. It provides a standard compliant mobile XMPP client out of the box. This product is ideal for developers who want to add XMPP based instant messaging to their apps. It’s also great for companies who already have an XMPP server and want to allow their employees to be able to communicate while using their mobile devices. When you buy a license, you get access to the complete source code in the form of an Xcode project. Once you’ve set the IP address and name of your XMPP server, you can be testing the messenger in minutes. With full access to the source code, it’s easy to integrate Chat SDK with your existing application or to change the branding and release it as a stand-alone app. Check out the full feature list on our features page. Chat SDK for XMPP has been thoroughly tested against the ejabberd server. It’s also been verified for inter compatibility using Adium. The SDK supports the following client XEPs. There are a number of different licenses to suit every budget. From the basic single app licenses which allows the Chat SDK to be used in one application to the enterprise license that supports unlimited applications and has 6 months support. v4.1.2 - Multiple bug fixes and performance improvements. v4.1.1 - Made fixes to asset loading for dynamic frameworks. Added helper methods to make it easier to load assets from framework bundles.